The film that the group Left Forum is screening this month is With Babies and Banners: Story of the Women’s Emergency Brigade. 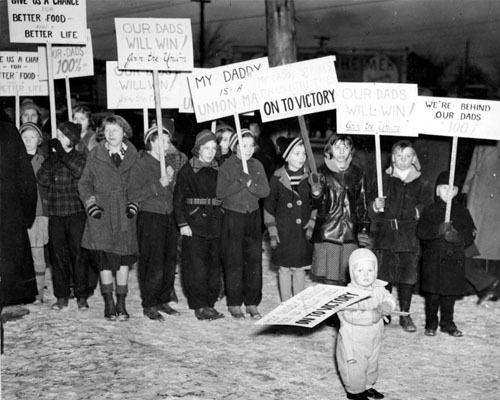 This film tells the story of women’s role in the victory of the United Auto Workers (UAW) sit-down strike From December 1936 to February 1937. The men occupied inside the General Motors Fisher Body 1 and 2 plants in Flint, Michigan. The women braved police and National Guard troops, forcing big auto to back down. Intercuts footage from 1937 with interviews with the same women 40 years later, still active and demanding the UAW acknowledge women as equals.